The 2017 Hudson River Derby kicks off 10 days before it was planned as the Red Bulls host New York City FC in the Lamar Hunt/U.S. Open Cup at Red Bull Arena Wednesday. For the next three days, FrontRowSoccer.com will feature a series of derbies and rivalries at various levels. 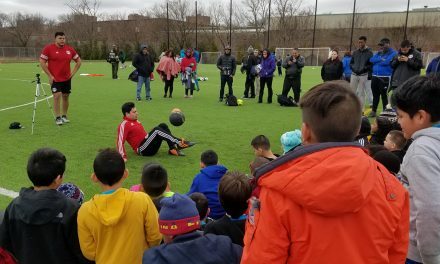 This one, at the youth level, took place between two teams from the East Meadow Soccer Club on Long Island way back in 2003. The story was written on June 13, 2003. It is a quandary that not many youth soccer club presidents have ever faced: Which team to root for at the State Cup championships. 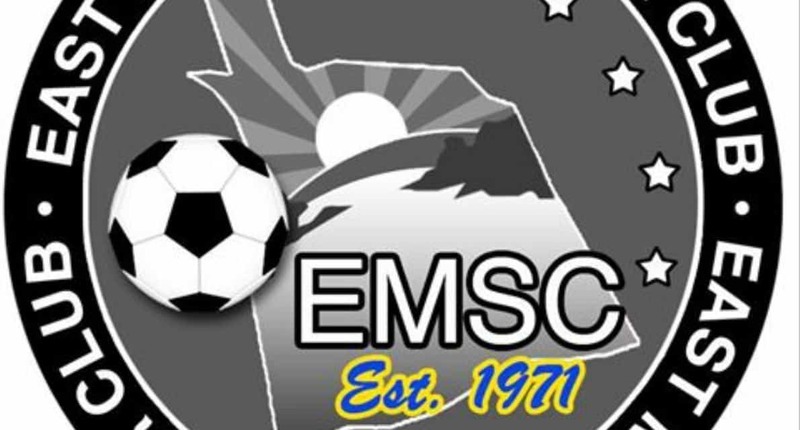 When the two finalists line up in the Girls Under-13 championship game of the Eastern New York Youth Soccer Association Open Cup at the North Rockland Soccer Complex in Haverstraw, N.Y. on Saturday, the East Meadow Dynamite will be defending one goal. Guarding other net with similar determination will be the East Meadow Shooting Stars. “I can tell you that East Meadow is going to win,” East Meadow Soccer Club president Stan Ruppenthal quipped earlier this week. While teams from the same club will collide in earlier rounds of the State Cup competition, knocking heads in the final is quite a rare event. In fact, according to research this is only the third time it has occurred in Eastern New York history. The Massapequa Express and Falcons battled for the Girls U-19 crown in 1982 and the Massapequa Millennium and Shockwaves vied for the Girls U-11 championship in 2001. Ruppenthal, of course, is elated that two East Meadow sides are vying for the same coveted championship. “It is a rarity,” Ruppenthal said. “It is an honor to have one State Cup finalist.”This year, Ruppenthal and East Meadow’s State Cup hopes runneth over and then some. 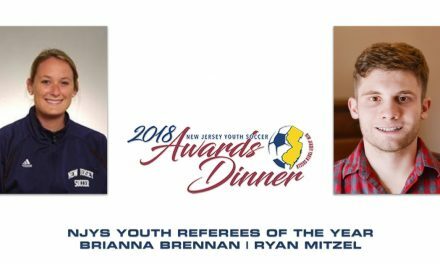 The Nassau County club has five finalists — the Hawks, who will vie for the Boys U-10 title and two other Girls’ teams –Intense Magic (U-14) and Dream Team (U-18). But if there is one match that will pique the interest of club members in particular and soccer fans in general it will be the Dynamite vs. the Shooting Stars on Field A. Kickoff time is scheduled for 11 a.m. The game will pit friend vs. friend and classmate vs. classmate. Most of the players attend W. Tresper Clarke Middle School in Westbury or Woodland Middle School in East Meadow, N.Y.
“From our point of view, it’s unbelievable, unbelievable to us,” Ruppenthal said. “The children and players on both teams have worked extremely hard. We are very proud of both teams in the final. The coaches know each other fairly well, too. They have faced each other many times before in what is called a “friendly rivalry” by Liebhaber. Earlier this week Alio wrote a letter to and spoke with Liebhaber. “I told him, I wish you good luck and little extra luck for us,” he said. Liebhaber understands the curiosity surrounding the uniqueness of the match, but won’t let the hype get in the way of the match. The last time these two teams met, the Shooting Stars recorded a 3-0 victory in the Spring of 2002. They haven’t met since because they play in two different leagues. The Dynamite performs in the Eastern New York Premier League Girls, the Shooting Stars in the Long Island Junior Soccer League. As last year’s Open Cup Girls U-12 champions, the Dynamite has to be considered the favorites, although Alio isn’t so sure. For Saturday’s encounter, the Dynamite will get to wear the club’s first uniforms — gold — while the Shooting Stars will wear blue. These two teams obviously had a built-in rivalry coming from the same club, born in the same year. Tryouts were held in 1998 and the best players were picked for the team that would be called the Dynamite. At the time, Alio noticed there were seven pretty decent players — including his daughter, Sara, and Sade, the daughter of Akeem Ayinde, who would become his assistant coach, who didn’t make the cut, so he decided to form another team at the same age group. That type of situation isn’t so rare in youth soccer. It is rare that the “second team” would be so competitive. So, the Shooting Stars were born. “We were called the farm team, the B team. Fortunately, the club eliminated the A-B rule. Added Alio: “We’ve been in the shadow, but we’ve been a thorn in their side. The Shooting Stars applied to join the ENY Premier League this season, but were rejected. So, they went about their business in LIJSL Girls U-13 Division 1. They are tied for first place with the Albertson Fury with a 4-0-1 record. They also will meet the Stony Brook Hornets for the Girls U-13 Major title of the Waldbaum’s Cup on Sunday. Beyond winning, what Alio is most proud about is his team’s make-up, which he estimated players with 14 players representing 14 countries and backgrounds. That includes a Palestinian, a Jewish player, Central Americans and several Hispanic players. “I truly have a mosaic,” he said. The Dynamite has been club pioneers as East Meadow’s first State Cup finalist and first club team to win a State Cup. Last year the Dynamite defeated the Massapequa Shockwave, 5-0, to win the Girls U-12 Open Cup crown. The Dynamite hasn’t fared as well in the Premier League with a 1-4-1 mark. But you have to remember it is a U-13 side competing with U-14 teams. One year can make a big, big difference in youth soccer in physical and mental maturity. “It’s a very challenging league,” Liebhaber said. Besides club bragging rights, Liebhaber cites other reasons to win — an opportunity to play again at the Region 1 tournament. This year’s event is scheduled for the University of Rhode Island from July 3-7. Ruppenthal, the club president, is sad that only one team will go to Rhode Island. What has been impressed Ruppenthal the most is how Alio and Liebhaber have comported themselves with their teams and within the club.